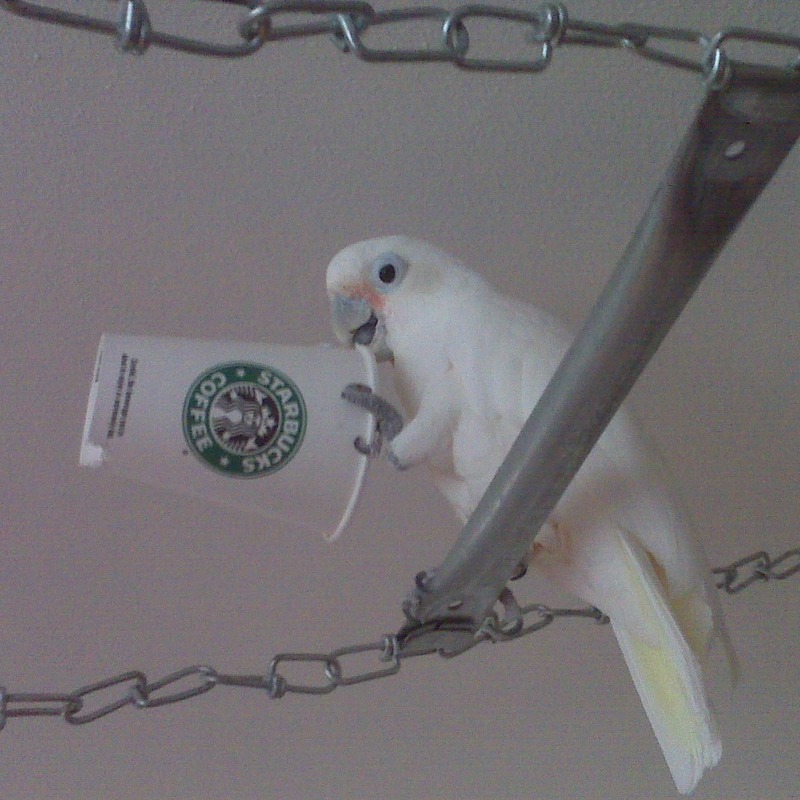 The Zen Parrot: Of Parrots, Politics, and Coffee: We Wish We Could Blog More About Parrots. We Really Do! We Wish We Could Blog More About Parrots. We Really Do! We wish we could blog more, and more frequently, about parrots (as well as politics and coffee). We really do! Thing is, we have eight (count them: 8) actual parrots that we have to care for that demand our time and attention. 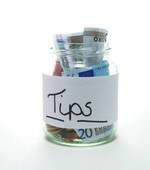 As well as operating the parrot rescue Northwest Parrots Fund, and an online coffee shop The Parrot Cafe. That and the fact that we have to work for a living to support our parrots and parrot activities! A Ruby macaw (Greenwing/Scarlet mix) believed to be about forty years old, and a presumed male, Mr Cracker has been with us a year now. We rescued him when his owner of twenty-five years suddenly took terminally ill. After six months Mr. Cracker finally let me touch him. Now he begs for head scratches. He won't yet step up with me though. Mr. Cracker has taken to calling me Mark, his previous owner's name. Tillie is a confirmed female Timneh African grey parrot who is by far our smallest parrot and one of the sweetest parrots anyone will ever encounter. She came to us when her owner could no longer care for her. She loves flying laps around her bird room when she's not sitting on the window sill watching the wild birds out back. If I set her down anywhere, she automatically flies to my shoulder. Whenever I walk into her room, Tillie automatically reminds me: Hi Sweetie! It's Me! Just in case I get her confused with any other Timneh African grey parrot that might be around! Kid Kadra is a confirmed male Goffin's cockatoo parrot who served as a service parrot for a fellow with serious medical issues. We rescued Kid Kadra when that person suddenly died. His death was not discovered for several days. When Kid Kadra came to us he was comatose for two weeks. 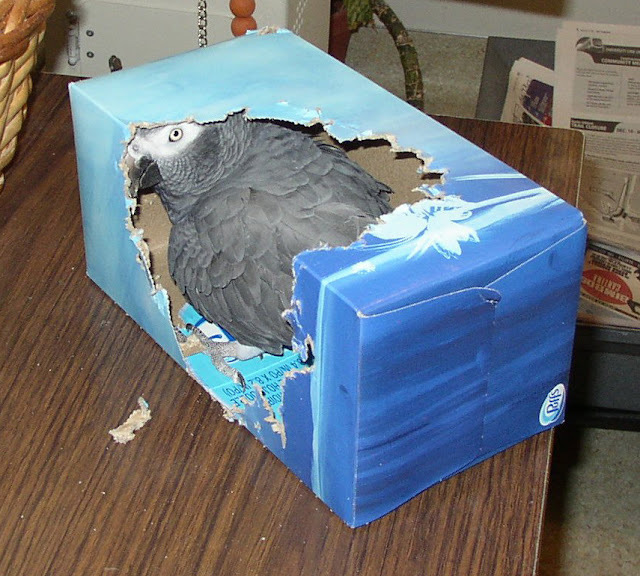 As is the character of Goffin's cockatoos, Kid Kadra is a typical teenage juvenile delinquent. Except that he loves to bathe. He would take a shower every day if given the opportuniity. 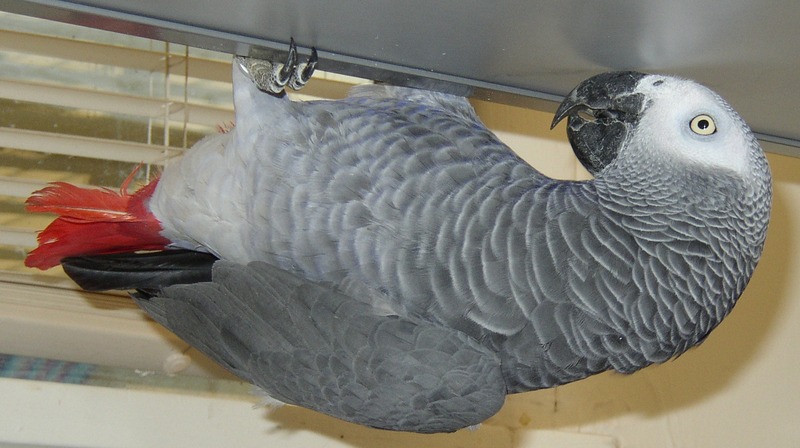 Arua is a confirmed female Congo African grey parrot whose owner also suddenly and unexpectedly died. His death was not discovered for three days, until a worried girlfriend (who lived across the state) alerted family members to his disappearance. Arua is a big girl by African grey standards and one of the friendliest African greys anyone will ever find. She insists on being part of any conversation in the house, and is the resident linguist. Arua came to us speaking Polish as well as English. She speaks dog as well as cat, and any number of avian dialects. 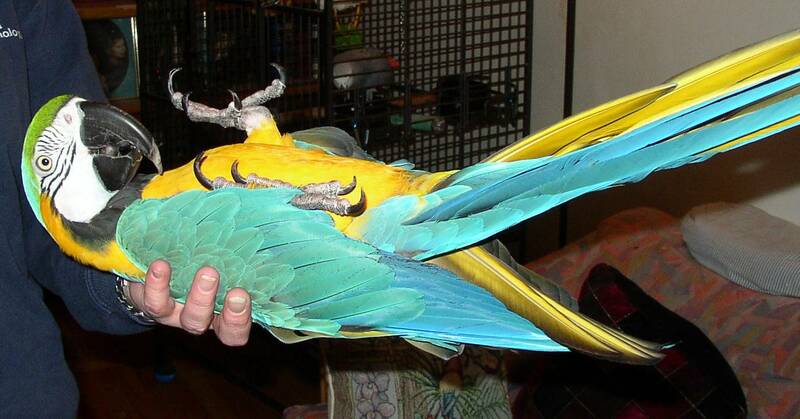 Aboo is our cowboy Blue and Gold macaw. Named for Aladdin's sidekick, the name fits. 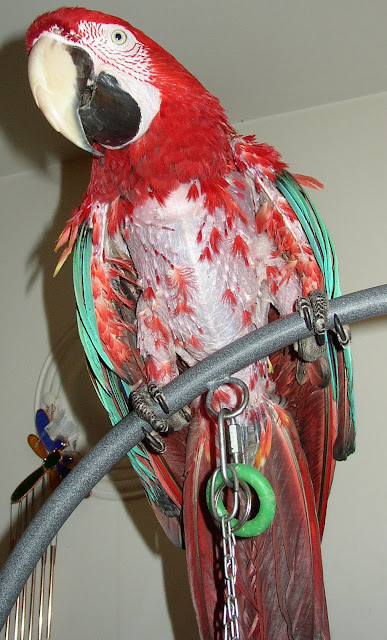 Unlike the other parrots, he would much rather not take a bath. A confirmed male, Aboo was literally dumped on our doorstep, considered to be unmanageable and unhandleable! Now I can literally hold him in the palm of my hand. Aboo has become a good friend to our Ruby macaw Mr. Cracker. Princess Tara is a confirmed female Hyacinth macaw, and as far as I can tell, probably the largest parrot in Seattle. She really is a princess! Her parents are a Duke and a Duchess. Princess Tara is one big girl! And she is a cuddle bunny and goofball, the classic ugly duckling who doesn't realize just how spectacularly beautiful she is. Princess Tara had been passed around to at least three different homes before she came to us, primarily because she knows she is big, and doesn't mind throwing her weight around. That, and the fact that when she starts her Hyacinth honking, she can blow your eardrums out! Miss Bubba Boy is a confirmed female Blue and Gold macaw that we rescued from a breeder who needed a male macaw for his breeding facility. Bubba's original owner was so sure that Bubba was a boy he never bothered to have her sexed. We did. We paid fifty bucks for a DNA test, but we kept her name anyway. She calls herself Bubba Boy! We could have saved the money! Within a month, Bubba laid her first clutch of eggs. 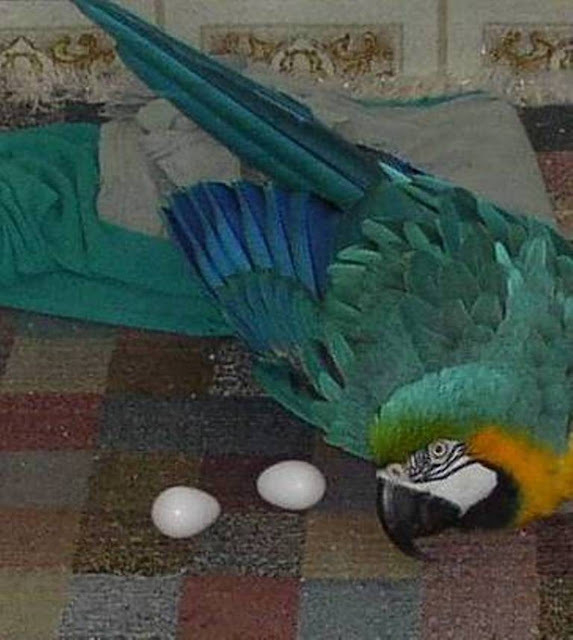 She has laid two clutches of eggs since she's been with us. Bubba immediately bonded to my partner, and tried to attack me every opportunity she got for about two years. Eventually we reached a detente. Now Bubba even hucks for me. Plus she knows that no one appreciates looking at her wings as much as I do! Our Diva parrot and Greenwing macaw Roxanne was named for The Police song. She even knows the lyrics! Roxanne also knows the lyrics to the Gene Autry song You Are My Sunshine. We recorded a duet with Roxanne and Gene Autry. The Gene Autry Museum in Los Angeles was so impressed, they sent us a nice note. We acquired Roxanne when we answered an ad in the Sunday classifieds. Roxanne's owner got divorced. Got remarried. Was moving out of state. The new wife gave him an ultimatum: Her or the parrot. We don't think he made the right choice. The first time we met Roxanne, she immediately stepped up with both of us. Roxanne's owner was astounded. She had refused to step up with any of the other people that had answered his ad. He dropped her asking price in half, and we came home with our first parrot. We only ever intended to get the one! The rest, as they say, is history.